Perhaps contentious, the words of the distinguished novelist Rumer Godden, OBE, whose work and remarkable life I admire, are on my mind. 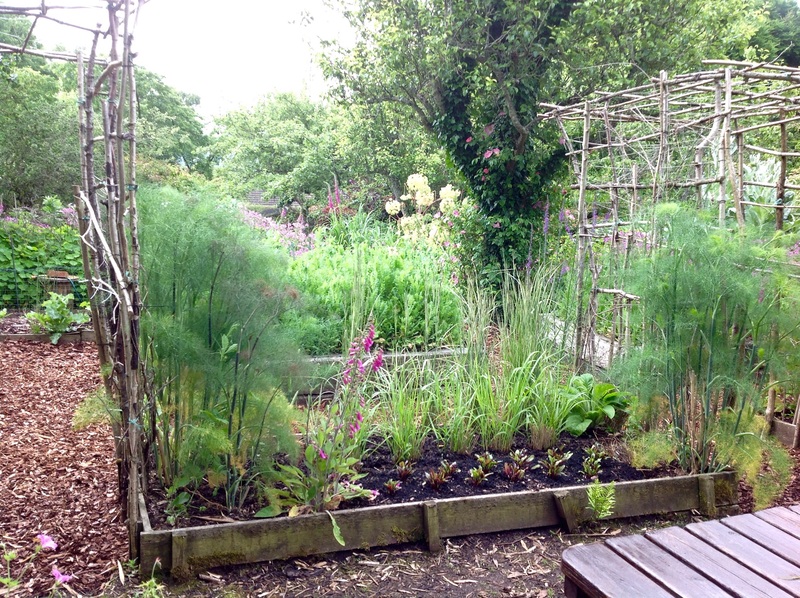 By mid July the vegetable garden-come-nursery is usually heaving with gluts of one sort or another. This year many of the raised beds have become the playground of self-seeders that crept in with the compost when my back was turned. It’s time to take stock of what’s useful or joyful, and to think about getting ruthless with things that are neither. Three year-old Anemeanthele lessoniana seedlings, flowering for the first time, pack the shadiest of the 4’x8′ beds. Next spring they’ll be moved out to replace the tired looking seven year-old plants surrounding the Acer griseum in the front garden. Meanwhile, I’m enjoying watching them swirl in the wind as a uniform dense mass. 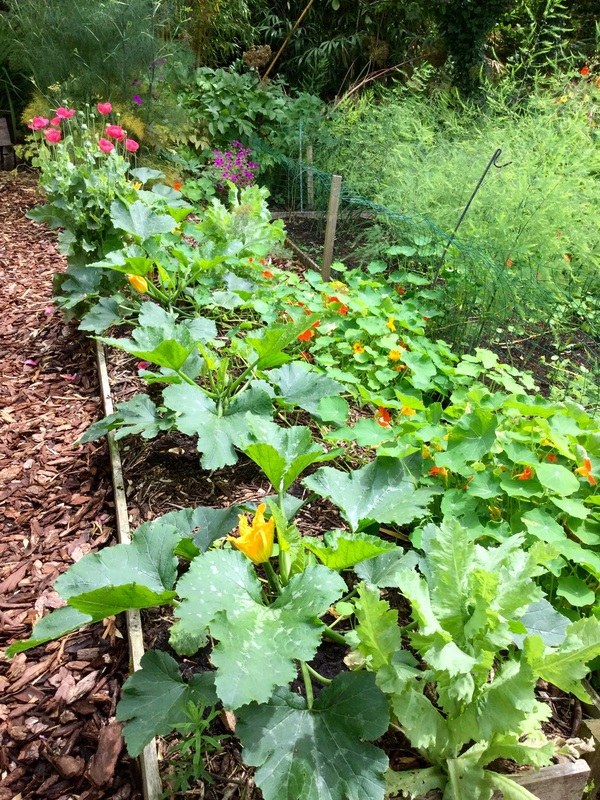 Two rows along, the courgettes are hitting their stride, until this week there have been lots of female flowers that have remained unpollinated thanks to the male flowers remaining stubbornly closed. Next year, I’ll go back to growing a self-pollinating parthenocarpic F1 hybrid like ‘Parthenon” for a reliable early crop. The 15’x6’ asparagus bed planted in 2007 yields handfuls rather than armfuls of spears, in retrospect planting a single modern French variety in a raised bed would have been better, especially on our heavy clay soil. Last weekend I cleared the broad beans, it’s been a poor year for them. First they were swamped by the five year-old mature ‘hedge’ of Geranium palmatum, then by black fly. The sweet corn is likely to suffer a similar fate unless I thin out the nasturtiums, at present the corn looks like swimmers flailing leafy hands in distress. I grow vegetables that satisfy two criteria : what Sarah Raven calls in her inspirational book The Great Vegetable Plot the ‘unbuyables’; and, then they have to be pleasing to look at in themselves. This year, there’s been a shortfall where both are concerned. It started back in late winter with a mad dash to an otherwise perfectly good local garden centre which surprised me with its uninspiring selection of seeds. This winter I’ll go revert to ordering online from specialist suppliers, Simpsons Seeds, Real Seeds, and Seeds of Distinction all have a wider choice. The veg patch table is looking bare of the usual seasonal cache of beans, courgettes and peas, but there’s always the gardener’s adage ‘next year’ to fall back on and it’s quite nice to sit there quietly for once and collect my thoughts. We had high hopes in February, the beds were carefully prepared to match. 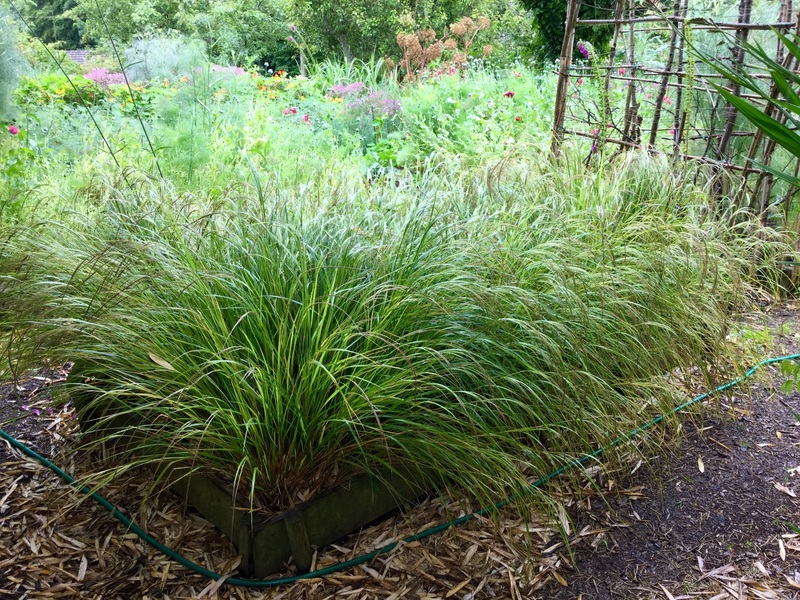 The over-wintering hardboard ‘membrane’ put off last year’s deschampsia seedlings, it also hastened the composting of the old bark paths. 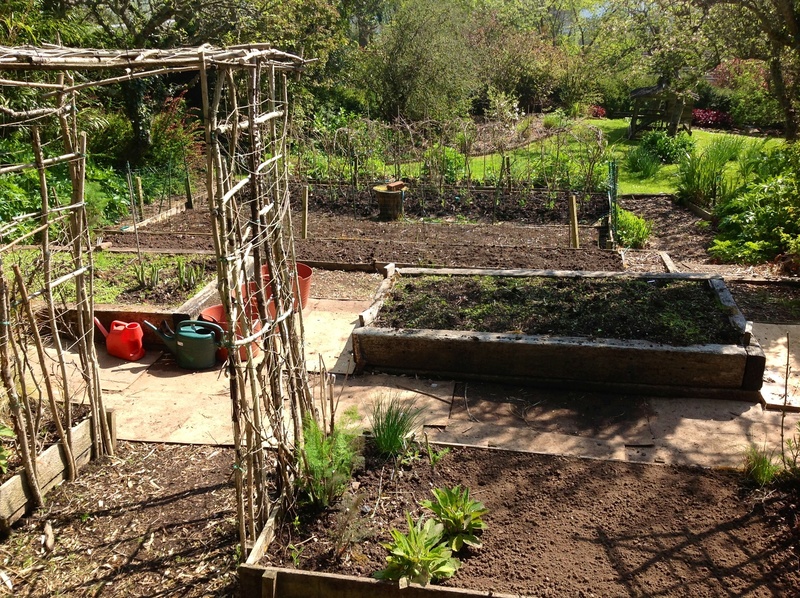 In May a decision was made to replace the squelchy bark paths, that put paid to time for tending vegetables. I wonder, is there joy in the fact that composted bark makes great soil conditioner? 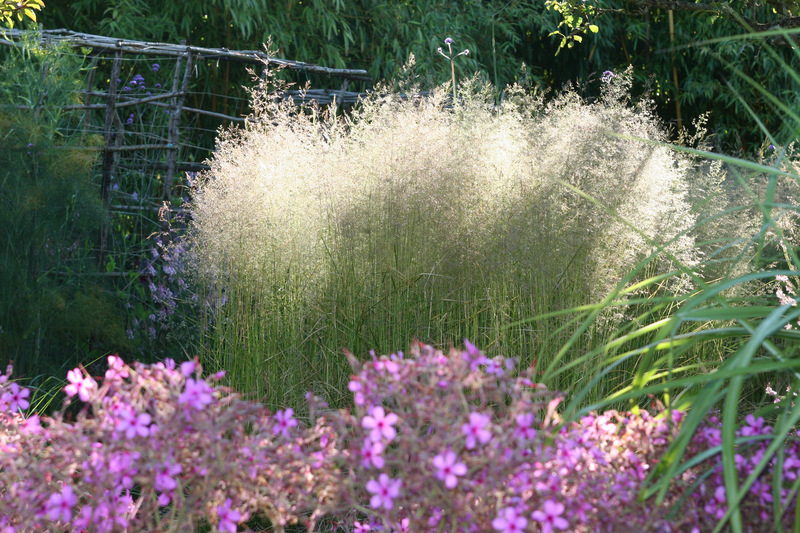 Last summer we took reckless joy in the display put on by Deschampsia cespitosa, knowing full well as we watched it puffing first golden clouds of pollen followed by prolific amounts of seed, that this would be the last straw for the paths. Even so, it was worth it! The deschampsia, as planned back in 2013, has been transplanted to a wild and woolly corner of the front garden, more conveniently bordered by mown grass. Here it’s the lead grass in the new stylised meadow where it can puff away to its heart’s content. The consequence of spending 40 unplanned hours carefully excavating 120 square feet of paths without damaging the underlying membrane is that not much else got done in this area. 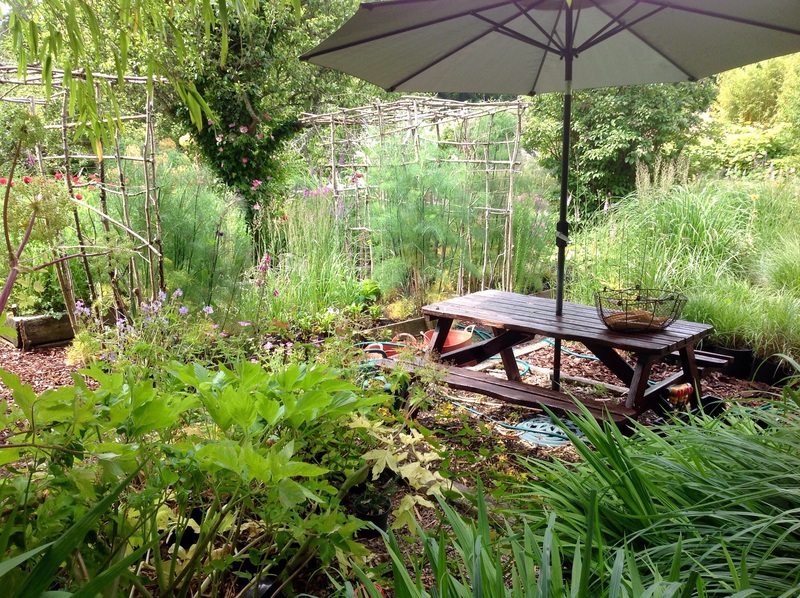 The hazel pergolas remain bereft of sweetpeas. On reflection, I think there’s something pleasing about the voids. The silvery structure has cropped up in many images I’ve taken for my records, even across the rhubarb bed. 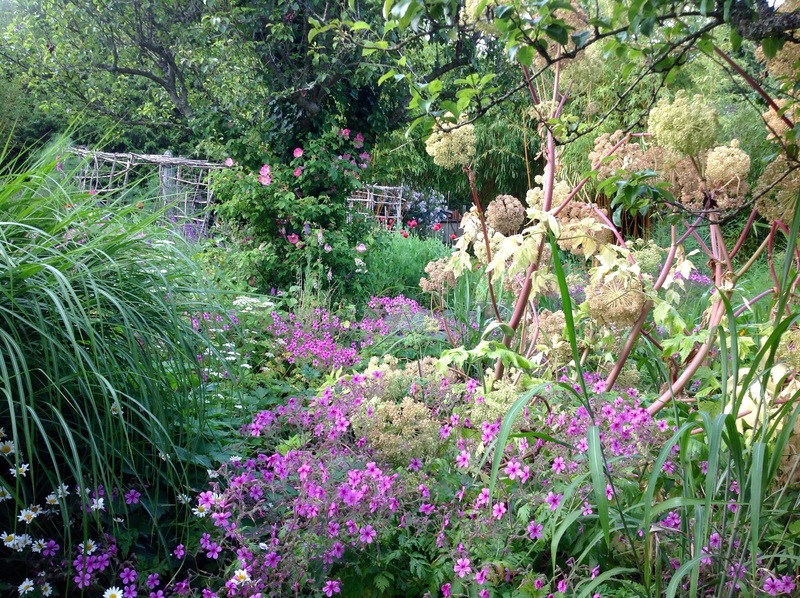 I’m pondering the mayhem we’ll face next year if the self-seeders have their way. The herb Angelica gigas, from seed given to me by my mother several years ago, is a divinely aromatic and gentle giant – the plentiful seed remains viable for a short time only. The same can’t be said for some of the others. However, I like to think that intrepid Rumer Godden might have approved of the spirit of the supposedly trailing nasturtiums that annually climb the peasticks and mug the peas. They’ve territorial ambitions and require cutting back hard to keep the paths passable. The peppery smell always reminds me of my maternal grandmother’s garden which was also awash with these jolly volunteers. Luckily, unlike Rumer Godden, we don’t really depend on the garden for sustenance. Unlike her, we don’t have helpers to be fearful of lest they poison us. Just as well with all these opium poppies about! 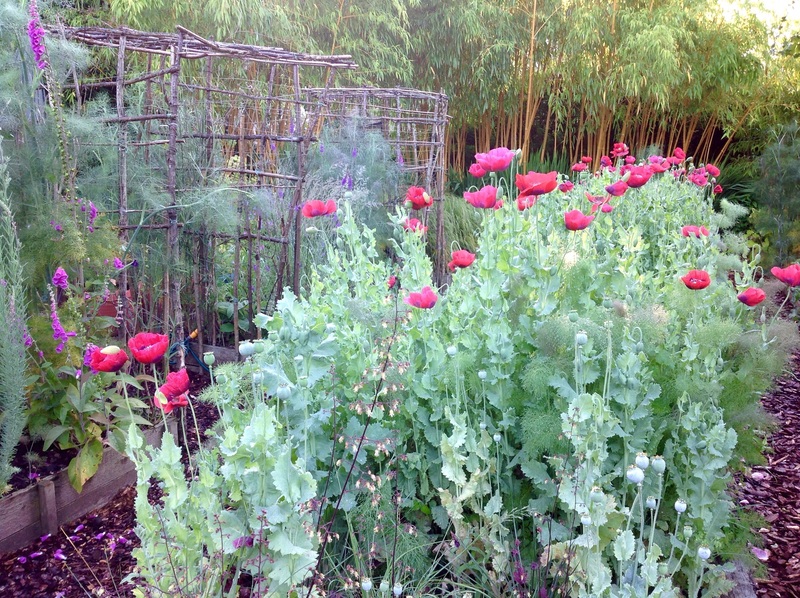 Papaver somniferum is endemic to the garden, the sight of it never fails to bring us joy. 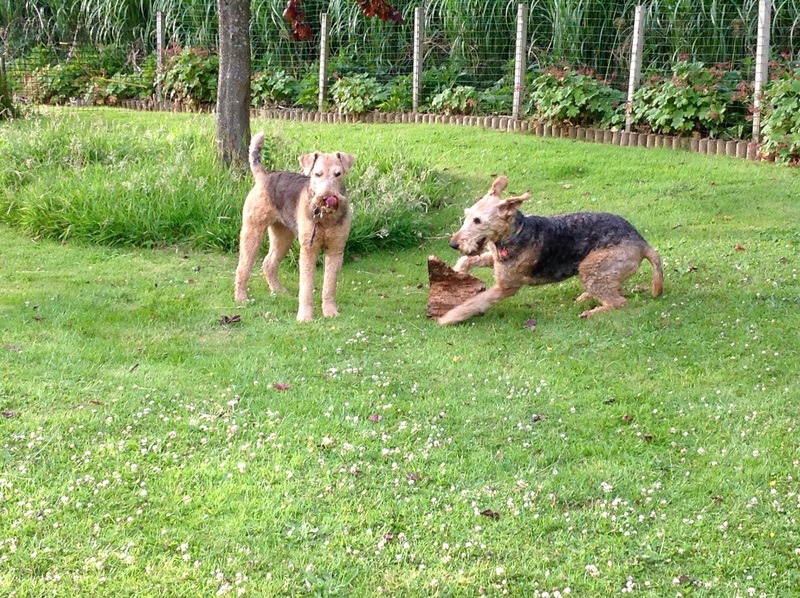 That’s why we named our happy-go-lucky second dog with the flying ears and long curly tail ‘Poppy’. She, bless her, thinks her name is “Biscuit”. Saffron, her great-aunt, often looks unamused . It seems, that in more ways than one, we’re collecting joyous wayward flowers. POSTCSRIPT : Anne Chisholm’s biography Rumer Godden : A Story Teller’s Life (Macmillan London, 1997) though out of print is worth tracking down. Rumer Godden was a castaway on Desert Island Discs in 1975 and 1996, the latter was repeated in November 1998 to mark her death at the ripe old age of ninety. 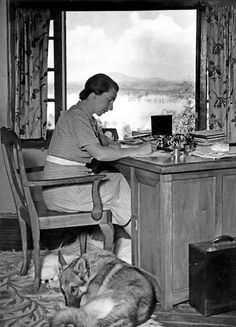 Her final choices were : Anthony Horwitz playing Schummann’s ‘Traumerei’ from “Scenes from Childhood”; a mystically refilling widow’s ‘cruise’ of whiskey; and, Edith Sitwell’s ‘The Atlantic Book of British and American Poetry”. 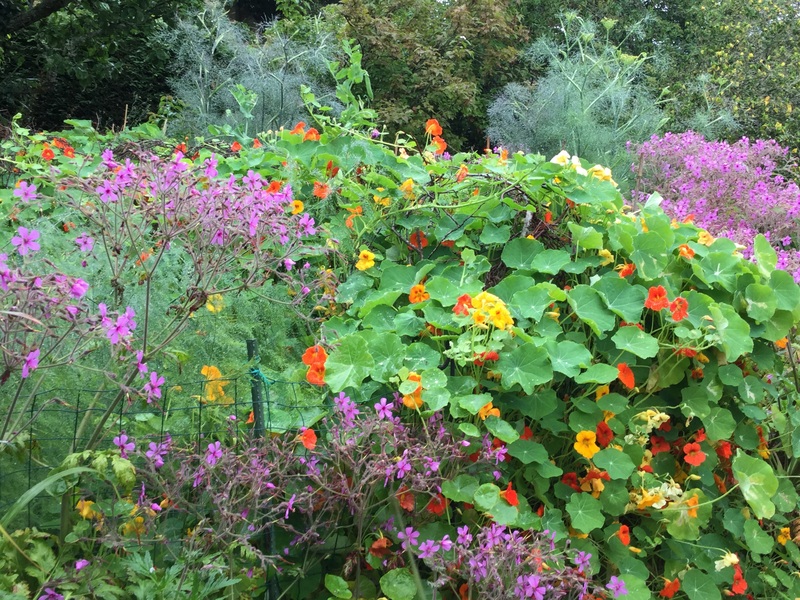 The nasturtiums and Geranium palmatum look wonderful. My broad beans were great this year with no blackfly, but it is always disappointing how few beans you get from so many plants. Your nasturtiums are jollier. I first read The Greengage Summer when I was quite young but it is a book I keep coming back to. The biography sounds interesting,I have just ordered it from Amazon. I think I’ve read the Victorians grew broad bean plants for their handsome foliage and fragrance … Can’t say that about mine this year! I shall take the schadenfreude as a comfort, lots of folk around here are lamenting aphids and wondering where the ladybirds are this year. I agree, the soil looses its oomph at about the same time the gardener does! If you’ve better road access than us, I can recommend http://www.thecompostshop.co.uk for bulk bags of well rotted horse manure. Since the wonderful horse sanctuary HAPPA closed we’ve found it hard to source locally too. Have you tried local stables and putting it on your Christmas list? I’m sure someone special would be happy to help bag it up. Otherwise, well composted bark is a good alternative, tree surgeons with forestry contacts might be able to help. Have a lovely weekend. Your bare wooden structures look very rustic and add ambience even if they aren’t covered with produce. I was hoping my frames would be clothed in squash by now, but alas every one planted out so far has been attacted by slug/snails. 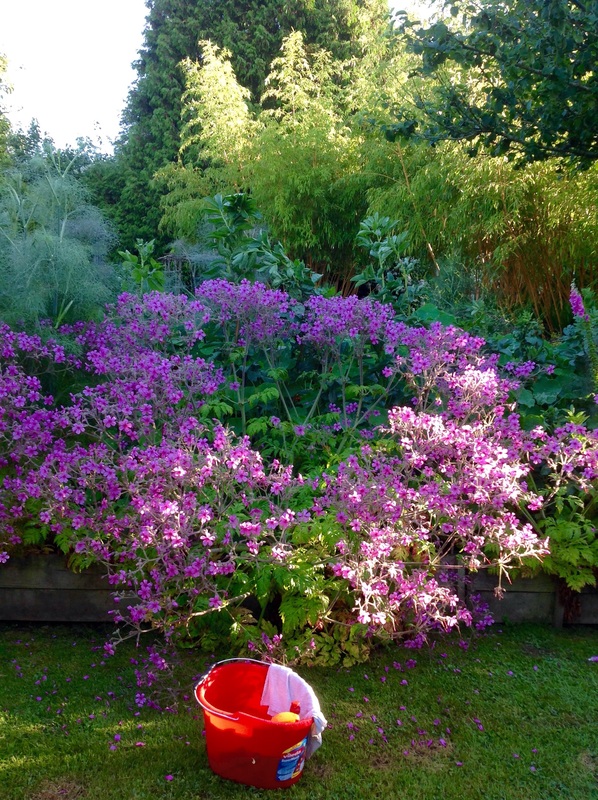 Love the shot of the geranium and angelica. Thank you for your kind comments. Sorry to hear about your squash plants, I love them if only for their architectural leaves. Better luck for us all ‘next year’. I think it’s great you managed to enjoy a wonderful vacation and return to those magnificent blooms, not to mention the peas/beans. I’ve never heard of dwarf broad beans, thank you for the timely tip. And, thank you for taking the time to look at the garden website here, also for the encouraging comment. I tend to regard my efforts hyper-critically …perhaps this is the same for many of us garden makers? Yes, I think we are all very hard on ourselves. The peas and beans are early here so we’re over before we went away in early June. Paws crossed : better luck ‘next year’! Yes, not only were the broad beans very badly afflicted with black fly this year (I had to ditch a first sowing and then tried to keep on top of a second and even so we only had about four meal’s worth) but the French beans are also suffering from an aphid-borne virus. I’ve now pulled out all my French beans and have re-sown with runners. Thankfully the Borlotti beans aren’t affected. I’m enjoying reading about your garden. Your blog is a great mixture of all I like best. Thanks Kate. Lots of sympathy from me! Borlotti bean pods are so beautiful, worth growing just for the colour. Such kind comments, thank you!